I found this 1930's autograph book in an antique store in Verona, PA. 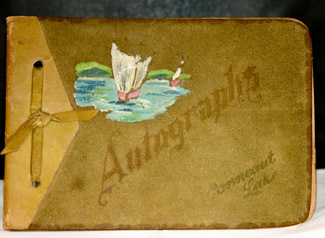 The cover of the book is etched with a lake scene and the words "Conneaut Lake", an amusement park in Northwestern Pennsylvania. The book includes some very precious little poems, written to Elinor, the book's owner. Here are a couple of the poems which have not stood the test of time! "When you get married and your husband gets cross, pick up the rolling pin and say I'm boss." "Butter is better, cheese is cheese, but what is a kiss without a squeeze?" "Roses are red, violets are blue, but sugar is not half as sweet as you." "When you get married and have twins, don't come up my house for safety pins." "I think you have a pretty face, and with me a space. School starts in September, I hope you can remember."